Champagne corks pop out of the bottle at the speed of 25 miles per hour. A team of German scientists discovered this after shaking a bottle of champagne. According to their calculations, it’s theoretically possible that corks fly at 62 miles per hour. This speed is not surprising considering the pressure in the champagne bottle is twice as high as in a tyre, namely six bar. So be careful when you open a bottle. Always keep your thumb on the cork when you remove the muselet (wire basket). Only when a bottle has been cooled in the fridge and hasn’t been shaken is there hardly any pressure and you don’t have to worry about the speed of the cork. 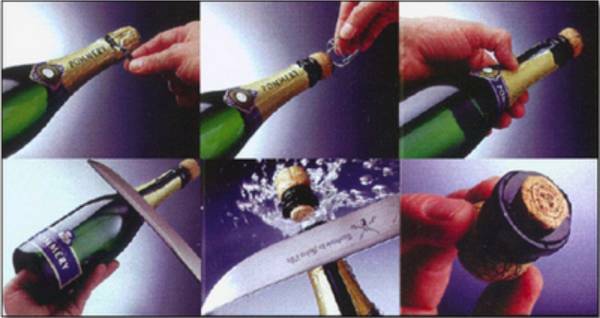 Sabrage is the art of decapitating a bottle of sparkling wine with a sabre. Tradition has it that the custom dates from Napoleonic times. Napoleon was a regular visitor to the Champagne region. He never went to war without an ox-wagon full of champagne. The story goes that in 1812, during the battle of Smolensk, the French sabered the bottles with their Briquet (a kind of sabre the French used at the time) for the very first time. Some sources however state that the Cossacks managed to seize the champagne from the French and humiliated their enemy by sabering the bottles. Today the art of sabrage is preserved by the Confrèrie du Sabre d’Or, a worldwide known brotherhood, established in 1986 by the French restorer Jean-Claude Jalloux. In order not to damage their Briquet, the soldiers of the 19th Century probably used the back of the blade and not the blade itself.. Nowadays the sabreurs use replicas of the French Briquet. They saber off the cork with the blunt side of the blade of a specially designed champagne sabre. These replicas are made of strong steel with a layer of nickel on top so that the sour champagne does not turn the sabre mat. The price of such a sabre and its accessories (case, sheath, sabre tassel and desired engraving) varies between 450 and 900 Euros. Luckily for the amateurs there are cheaper, though somewhat amateurish sabres on the market. You can find them in the champagne and souvenir shops of Reims and Epernay. What’s the correct way to saber off a cork? -	Chill the bottle to the correct temperature = 6 °C. -	Remove the foil, the muselet and the capsule. -	Tap the weakest spot of the bottleneck in one fluent movement. The sabrage is perfect when there are no glass splinters, the cut is straight and …no champagne has been spilt. You can buy champagne in bottles of different sizes. Up to bottles of the magnum-size, champagne matures in bottles ‘sur lattes’(on their side so that the cork is kept wet) before it’s made ready for sale. 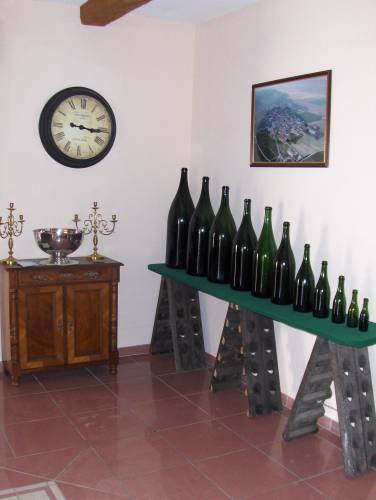 Smaller producers make larger bottles, from the Jeroboam onwards, only on demand. This large bottle is filled with the contents of several smaller bottles and attractively decorated. This has no doubt an influence on the quality of the bubbles, so you’d better not keep these bottles in your cellar for a very long period. They are very popular on special occasions like weddings. 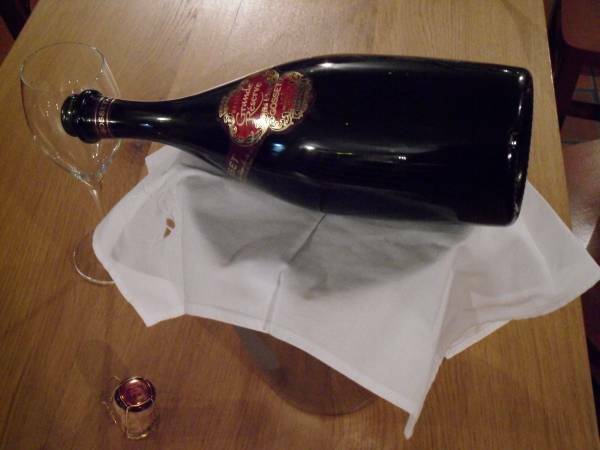 Large champagne houses have a bigger market and so a bigger demand for larger bottles. There you can buy champagne in Jeroboam bottles without any problem. Nowadays the proper champagne glass has a pointed bottom, broadens to the top and the board of the glass bends slightly inwards. This tulip shaped glass keeps the aromas in the glass and stimulates the formation of bubbles. In the 17th century the flute was the most popular champagne glass. Fashion made the glass smaller and taller. It became so unpractical for waiters and caterers that it was replaced with a coupe. The coupe has its own story to tell. Legend has it that the designer was inspired by the breasts of Marie-Antoinette, the wife of Louis XVI. Unfortunately, the coupe is totally unsuited for drinking champagne. The aromas and the bubbles disappear very quickly in this type of glass. Since people drank the very sweet Demi-Sec champagne in the Belle Epoque, those demerits were of no importance. Uncorking a bottle of champagne is a ritual, almost a ceremony. You remove the foil from the cork and the muselet (the iron basket that keeps the cork in its place). You tilt the bottle slightly and turn the bottle while holding the cork, and not the other way around. If you feel that the cork is about to pop out, you give it a little bit of pressure so that it comes out of the bottle with a little sigh, the so called ‘soupir érotique’. Did you know that you have to turn the iron wire six times before you can open the muselet? If the bottle is somewhat older, the cork will not come out that easily. Make sure you hold the cork tight. You can do so by leaving the muselet round the cork. The iron wires give you a better grip so that corks that are stuck can be removed in an easy and correct way. Nowadays there are special pincers to remove the champagne corks. Do not worry if you have no such appliance in your kitchen: a nutcracker can do the job. Do not open the bottles immediately after buying. If they are recently bottled, it’s best to let them rest for three months so that the liqueur d’expédition (liquor of wine and sugar added to the champagne after the dégorgement) can mingle in the bottle. 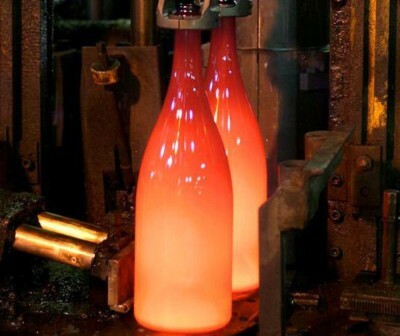 Always ask the producer the date of the dégorgement (process of removing the sediment from the bottle). Like still wines, you’d better let the best cuvées (Cuvée de Prestige, Millésimes, …) breathe before poring. You’ll be amazed which aromas the champagne will reveal after ten minutes. 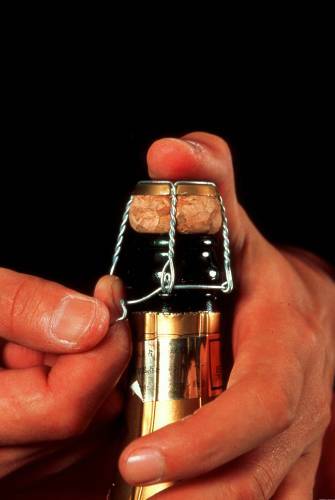 When you want to open a bottle of champagne according to the rules, the cork must not leave the bottle with a bang. The bang causes a quicker loss of carbonic acid. But if you’re having a party, you don’t have to follow the rules. What’s a party without banging champagne corks! It’s not only the uncorking of a bottle of champagne which has to be done according to the rules. The way you serve the beverage, how you refill the glass and put the empty bottle in the cooler has its rules and regulations. Like wine, champagne can taste of cork. So you always have to taste beforehand. After tasting you fill the glasses of the guests, but not in one go. The first time you pour two fingers of champagne in the glass, the second time you fill the glass to three quarters. If you want to pour according to the rules, you have to put your thumb in the soul of the bottle and make sure that the label is visible to all. You only refill the glass when it’s completely empty. If someone doesn’t want a refill, he communicates this by leaving a bit of champagne in the glass. If you fail to follow those rules, there’s no harm done. Just don’t put an empty champagne bottle topsy turvy in the cooler. Out of respect for the winemaker you spread the napkin over the cooler and place the empty bottle horizontally on the napkin, with the label upwards. Wedding, birth, Communion, … all these festivities are a good reason for presenting your own label on a bottle of champagne. Almost every producer makes personalized bottles. All you have to do is select a quality (Brut, Cuvée de Prestige, …) and send the producer a digital picture and the text you want on your label. Personalized labels are not expensive at all, but you have to order a minimum amount of bottles (the exact amount depends on the producer). Usually it’s possible to personalize the bottles from 18 or 24 onwards. Make sure you place your order some time in advance. The producer does not print the labels himself, he needs time to make some arrangements with the printer. - Spraying water over the buds, so a layer of ice prevents the temperature of the buds dropping below 0°C. In the Champagne region they heat their vineyards with stoves: chaufferettes. 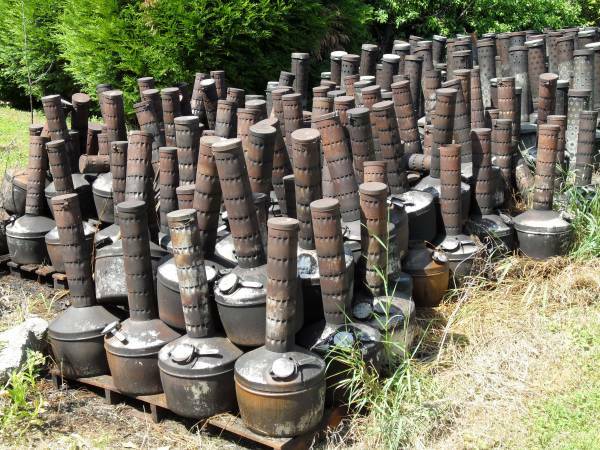 These stoves are spread evenly over the vineyards. They increase the temperature considerably and create an enchanting light show. 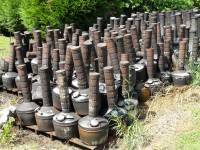 An alternative to the stoves are big pots filled with paraffin. Giant candles. Holes and bumps in the road, contraptions to limit your speed, give the bottles you bought in the Champagne region a rough journey home. Try to limit the impact of the ride by putting the bottles in your boot horizontally to the direction of the traffic direction. This way you diminish the impact of braking and accelerating. A bottle that has made a journey of a couple of hundred miles has to rest before being opened. That’s the case with all kind of wines. If you want to store your champagne in the best of circumstances, you need a dark place, where there’s no draught or vibration, which has a constant temperature between 10 and 14°C and an atmospheric humidity of 80%. If you have a wine fridge, all those requirements have been fulfilled. Without a fridge you must try to meet the requirements as much as possible. Bottles should be stored horizontally and not vertically. Though some people pretend that vertically stored bottles keep their bubbles longer, we prefer to store them horizontally because a moist cork is the best way to seal a bottle. How long can you keep your champagne? As a rule champagne can be kept (under the best of circumstances) as long as it took to mature. 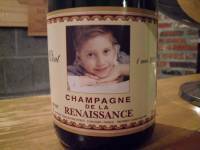 A Brut ‘sans année’ has matured for two years, so it can be stored for two years. However, our advice would be to drink the ‘sans année’ within the year. Special cuvées and Millésimes can be stored much longer. Those champagnes mature usually longer than the regular cuvees and have either no Pinot Meunier, or only a limited amount. This is a marvellous grape variety, but its weakness is its limited storage potential. You mustn’t be shy about asking this - especially if you’re not planning to open the bottle in the near future. James Bond is loyal to the throne and to his glass of Bollinger. At least that’s what the moviemakers want us to believe. 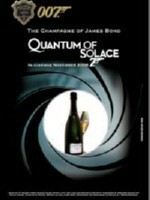 In Fleming’s books 007 drank Taittinger. Bond drank and ate all the things Ian Fleming loved and Taittinger was Fleming’s favourite champagne. Until 1963 James drank Taittinger on the silver screen. ‘From Russia with love’ changed it all, by using a poisoned glass of Taittinger in the script. This was the reason why the champagne house severed all ties with MI6. So from then onwards James Bond drank Dom Pérignon. He did so in: Dr. No, Goldfinger, Thunderball, You only live twice, On Her Majesty's Secret Service, The Man with the Golden Gun, The Spy Who Loved Me. In 1979 Bond became a loyal Bollinger drinker. Since then the brand is inextricably bound up with 007: Live and Let Die, Moonraker, A View to a Kill, A License to Kill, The Living Daylights, Goldeneye, Tomorrow Never Dies, The World Is Not Enough, Die Another Day, Casino Royale, Quantum of Solace, Skyfall. When Dom Pérignon invented a method to make wine effervescent, he was immediately confronted with the problem of sealing the bottles. At first the bottles were sealed with a wooden pin, soaked in oil and wrapped in jute. A layer of wax topped it off to make the bottle completely airtight. This was far from ideal and the wooden pin was replaced with a cork, kept in place by a flaxen thread. The pressure in the champagne bottles was so high that the cork often cut through the flaxen thread. In 1844 Adolphe Jacquesson had the idea to place a cap (a metal plate, also called the ‘plaque’) between the cork and the flaxen thread. The valuable content was no longer lost by damaged corks, but the thread was still eaten away by rats or corroded in the moist cellars. It took about 10 years before the traders started to use iron wire. They needed special pincers for making loops in the thread and to tighten it around the cork. The first company that specialized in making ‘plaques’ was Lemaire. At first the caps were neutral but later on the word champagne appeared in the cap. In 1906 Champagne Pol Roger was the first to adorn the caps. There still are anonymous caps, collectors call them “passe-partouts”, but most producers have a personalized cap. Some producers even have a different cap for each cuvée. 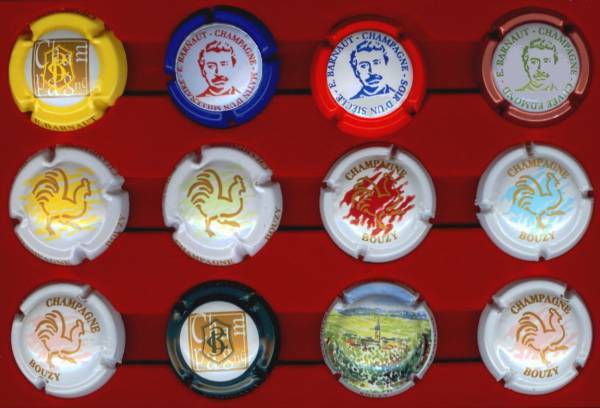 More than 150 years after inventing this functional appliance, some 30,000 placomusophiles collect champagne caps. Every day new caps are being introduced, so the number of collectors will increase. Lambert’s catalogue is the bible of the placomusophiles and is considered to be the reference for determining the exchange value of the different caps. De catalogus van Lambert is de bijbel van de placomusofilisten en geldt als dé referentie voor de ruilwaarde van de verschillende plaques. True hobbyists scour exchange marts and jumble sales looking for a new cap to add to their collection. There are specialized websites like: www.aupalaisducollectionneur.com and www.lacapsule.com where you can buy caps, and of course there’s E-bay. Placomusophilia is a marvellous hobby. Do you feel the urge to start collecting caps? Open a bottle of champagne and you’re off. Or do you prefer to collect the labels? Fine, then you can call yourself an ‘oenolabelphile’. Beside you can find the caps of champagne house E. Barnaut. You can buy them in their boutique or have them sent by mail. …Gosset, the oldest wine house in the Champagne region started in 1584. 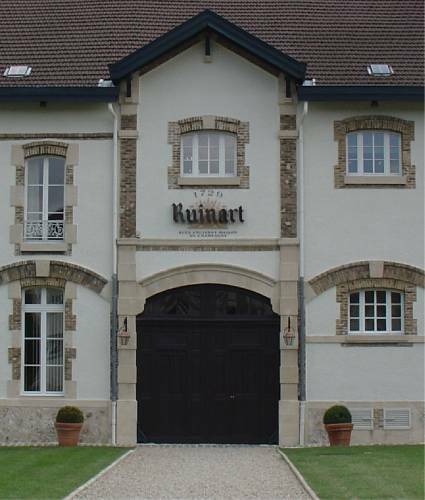 …Ruinart the oldest champagne house started in 1729. 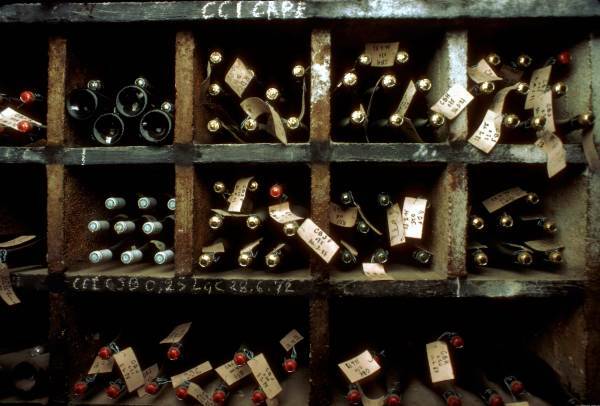 Other old and renowned champagne houses are: Taittinger (1734) and Moët (1743). …The biggest barrel lies at Mercier? The barrel was manufactured especially for the world exhibition in Paris in 1889 and has a content of 150,000 litres (= 200,000 bottles). …the biggest bottle of champagne (2 meters high) and the biggest cork (1 meter high) can be found at Beaumont de Crayères in Epernay? Both curiosities are exhibited at the entrance to the house, you simply can’t miss them. …it is useless to hang a silver spoon in an open champagne bottle to prevent the carbonic acid evaporating? It’s an old wife’s tale. The only thing that works is a decent champagne stopper. …the foil around the bottle neck did not have a decorative function at the beginning? The foil dates from the period when no liqueur d’expédition (liqueur of wine and sugar) was added after degorging (when the sediment is removed from the bottle) The foil had to hide the low level in the bottle. In other words it was an optical illusion. Today the foil only has an aesthetic function. 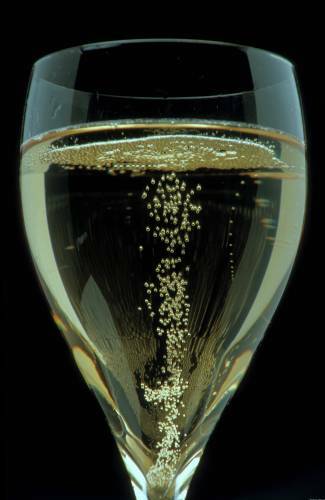 …Champagne bubbles are so small you can’t see them with the naked eye? The bubbles we do see are lots of miniscule bubbles sticking together. There are about 47 million of them in a bottle. 13th of May 1950, this was the day on which started the cronicles of a car race which would evolve to become the most prestigious racing contest in the history of the automobile: Formula I. The first Grand Prix took place on Englands Silverstone circuit. The circus passed on to Monaco, Indianapolis, Bremgarten, Spa-Francorchamps and on the 2nd of July 1950 the Grand Prix of France started. This sixth Grand Prix of the season was raced on the street circuit of Reims-Gueux. A dazzling, triangular circuit that switched from straights to curby parts in the midst of the sloping vineyards. The circuit was extremely famous as it asked the utmost of the pilot and his machine. The Argentinian Juan Manuel Fangio was the fastest that day on the just over 300 km long (200 miles) circuit. The producers Paul Chandon Moët and Frédéric Chandon de Brailles,two cousins and admirers of car racing, offered a jereboam Moët & Chandon to the winner of the first Grand Prix FI on French soil. This generous gesture was appreciated greatly. A new ritual in Formula I and other motor racing contests was born. Initially the winners just took their bottle of champagne home, this changed a bit awkwardly in 1966. Then the Swiss driver Jo Siffert, winner of the 24 of Le Mans, unwillingly enriched the rite with an extra ritual. The cork unexpectedly popped out of the too warm bottle he just received and the crowd was given a real champagne shower. The following year, in 1967, the American Dan Gurney celebrated his victory purposefully with a champagne shower for the bystanders. The shaking of the champagne and the spraying of the crowd after podium ceremony became a tradition on nearly all podia of car races. With the exception of Bahrein, where, out of respect for the Islam culture, they spray a non-alcoholic rosewater drink known as Waard. From 2000 to 2015 the renowned champagne house G.H. 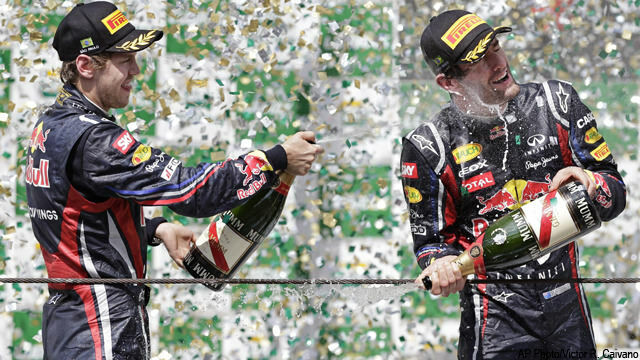 Mumm was the supplier of the champagne showers on the stages of the formula 1. Since season 2016 the pilots spray each other on stage with American bubbles from Napa Valley: Chandon Sparkling Wine. Why? Bernie Ecclestone did not agree with the downsizing of G.H. Mumm's sponsor budget and took the drastic decision to switch to a much simpler bubbly. Nico Rosberg was the first world champion who celebrated his title with a modest sparkling wine. Our taste buds easily recognize salty, sour, sweet and bitter flavors. From childhood we are taught that these are the only four basic tastes, but ... is this true? At the beginning of the last century the Japanese Professor Ikeda discovered a taste that did not correspond to the 4 aforementioned flavors. He called this "new" strong taste "umami", which means "savory" in Japanese. 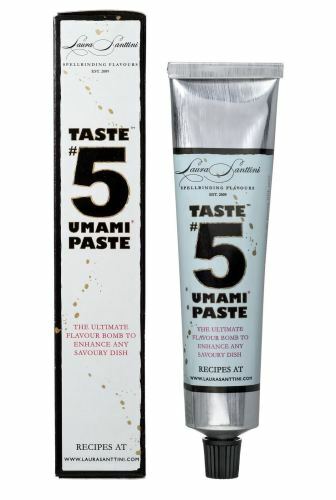 The substance that determines the taste umami is monosodium glutamate from the amino acid glutamic acid. It arises from the degradation of proteins during the preparations of meat or fish, during the ripening process of fruits and vegetables or during fermentation processes. (Amino acids are the building blocks of proteins we find in animal and vegetable proteins) As champagne is the result of a fermentation process we can make a scientific link between champagne and the umami taste. Champagne matures "sur lies" (= the yeast residue). 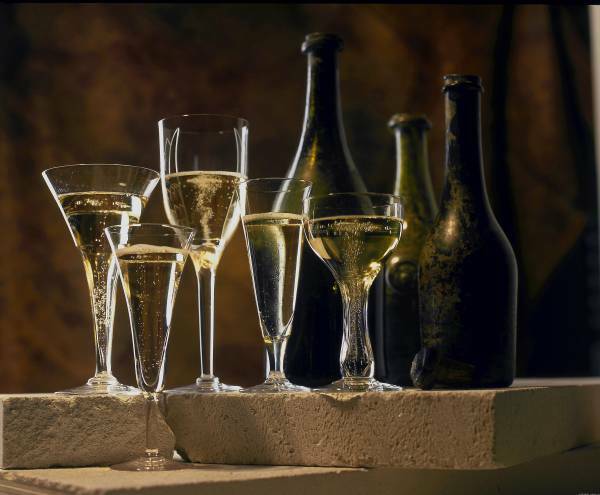 Old champagnes, especially old vintages, are in contact for a long time with the yeast residues in the bottle. Hence, there is a certain affinity between champagne and umami-tasting products such as: soy sauce, aged cheeses or seaweed. 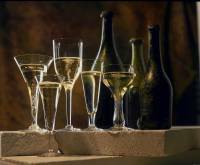 Nowadays, it is also apparent that champagne is richer in amino acids than any other wine. In the Champagne region, the people are also aware that the natural resources of the current and future prosperity are limited. Therefore, the protagonists in champagne activities contribute to sustainable development and seek to reduce their carbon footprint. Each year, 150,000 tons of wood are cut by wine growers in the Champagne region. 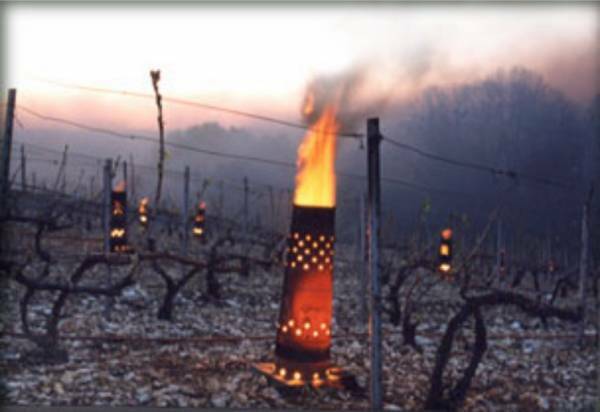 Previously, the prunings were burned (or used to barbecue) or simply left to wither in the vineyards. Today, the branches of the vine are brought to the glass factory Verallia in Oiry which is the main producer of champagne bottles. In this glass factory the wood is transformed into gas. This gas is used to fuel the glass furnaces. This completes the circle, the wood of the vine is the fuel for the production of champagne bottles.